For most healthy individuals stockings, pantyhose or tights are simply fashion choices to complement their choice of dress with a more finished look. If you are suffering from the effects of lymphedema however, compression and support hosiery could take on a whole different meaning and suddenly become a life saver. Lymphedema can cause different body parts to swell enormously and without the pressure from compression stockings or pantyhose or compression sleeves, the swelling could become severe enough in some cases to be life-threatening. To control the swelling and forcing the lymph fluid out of the arm or leg and back into the body it is important to follow the daily ritual of wearing compression stockings or sleeves religiously without fail. There are basically two types of lymphedema. Lymphedema known as primary lymphedema is already be present at birth. Fortunately this type is quite rare. What is known as secondary lymphedema does not become apparent in the majority of cases until it is triggered by some traumatic event later in life (e.g. surgery, cancer treatment or anything that can traumatize or damage the lymphatic system). In most cases lymphedema is an incurable life-long illness that manifests itself through chronic swelling. Usually the swelling affects the arms or legs of the individual and is caused by the accumulation of lymphatic fluid in the body’s tissues. One patient fittingly described the disease as a life sentence, not a death sentence, and vowed to make the most of everything she can do. It should also be pointed out that lymphedema is still poorly understood in the medical community and is often misdiagnosed as patients simply being overweight. Lymphedema – What Is It And What Causes It? Unfortunately there is little to no research concerning the causes of the disease and why some people are more or less likely to develop lymphedema. Lymphedema in simple terms is essentially a blockage or disruption of the flow of lymph fluid, which causes it to collect and build up in the tissue layer underneath the skin resulting in more or less severe swelling. This type of swelling from lymph fluid accumulation is known as lymphedema. Complications from surgery (e.g. a subsequent infection) and cancer treatments have been identified as two potential triggers for lymphedema. Another important risk factor is excess body weight, which is of particular concern considering the still worsening obesity rate of the U.S. population overall. According to the National Cancer Institute, (www.cancer.gov) lymphedema is one of the most common side effects of breast cancer surgery and other types of cancer treatment (e.g. radiation therapy). In addition, one of the most frustrating truths with lymphedema is that it may start at any time, either shortly after surgery or cancer treatment or many years later. Consult your physician if any of the above described symptoms are present! 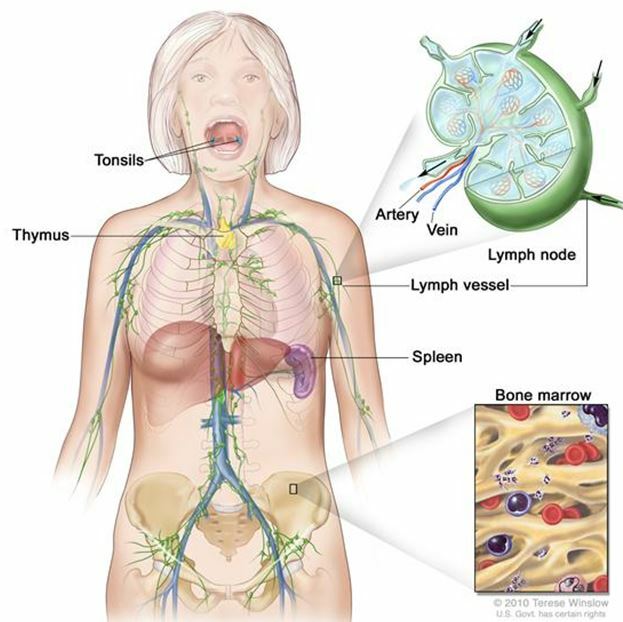 The image shows the lymph system, the lymph vessels and lymph organs including lymph nodes, tonsils, thymus, spleen, and bone marrow. The lymph enters the blood through a large vein near the heart. What Can You Do To Protect Yourself Against Developing Lymphedema? While there is no complete protection against lymphedema, it is certainly beneficial to avoid risk factors such as being overweight, unnecessary surgeries etc., as much as reasonably possible. Be especially observant for any changes that are going on with your body that may signal the beginning of lymphedema. On the upside, doing certain exercises with the goal of getting fit and maintaining a normal weight can reduce your lymphedema risk. On the downside some types of exercises can actually increase your risk or make things worse if you already have lymphedema. It is therefore very important to be coached by a trained health and/or fitness professional to get off to a good start with your exercises. How Can Compression Stockings Help With Lymphedema? Compression stockings or compression sleeves for the arms can help control and/or reduce the swelling caused by lymphedema. The key to their effectiveness is proper sizing and fitting of the compression garments. Please also read our post … Problems Associated with Graduated Compression Stockings – The Importance of Correct Measurements and Sizing for detailed information on this topic. Compression sleeves or hosiery are helpful for people who are suffering from lymphedema. If you are in a risk group for the disease, you should first discuss with your physician whether you should be wearing compression hosiery in certain situations (e.g. long distance air travel) or as a preventative measure in general. In any case it is extremely important that compression garments fit properly. Poorly fitting compression stockings or compression sleeves could potentially increase the risk for lymphedema or worsen it if you already have it.